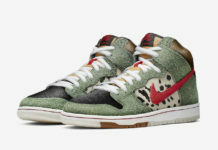 Nike Skateboarding gives their Nike SB Dunk High the perfect seasonal makeover with the release of this Nike SB Dunk High Dark Loden colorway. The Nike SB Dunk High features a Black-based upper with matching heels and laces, along with Dark Loden overlays. A White midsole and Dark Loden rubber outsole finishes off the look. Check out the additional images below and you can now find the latest Nike SB Dunk High in Dark Loden available now through select Nike SB retailers like Premier. The retail price tag is set at $100 USD.